The eyelashes are going to be removed on Saturday. The glue bits are losing their blackness, and are looking whitish and lumpy, which I fear may suggest to the casual observer that I am harbouring a very slow-moving type of eyelash lice. They simply have got to go. The orange Essex-y girl who put them in swore I would not only get used to them, but become addicted. Ha! It has not happened yet. I find myself quite un-addicted to things that hurt and make me look scary to small children (including my own). Anyway, til Saturday, that day of sweet upper eyelid release. Hoo-bloody-rah! On to more pleasant things. On Sunday Barnaby turned six. He got a big plastic Nerf gun from his parents. Once, I would have freaked out about the gun and would have vetoed it, and googled something to thrust at Mark in order to support my tearful and worthy-sounding assertion that it would be bad for him and his development and he would become EVEN MORE violent, but now, six years and three days into this journey of parenting, I couldn’t actually care any less. And so on and so forth, in the world of disengaged parenting, of which I am the Master Guru. I know. It is freakishly good. It tasted good too. It had about three packets of butter, and quite a bit of food colouring. It was not a cake for parents with only one child. It was a cake for parents of multiple children who had crossed that gaping chasm of “Idealism” and reached “Resigned Compromise and a Bit of Shame”. I crossed that one such a long time ago (see para 2). But the cake triumph and general birthday jolliness all had an unhappy ending when Mark fell ill with a mysterious sleeping sickness, and blamed the food colouring. Which is all very counter-intuitive, because food colouring makes you hyperactive, innit? Not fast asleep on the bed in the middle of the day for hours and hours on the weekend. He did say there was some sort of accompanying stomach-trouble, which is all too uncomfortable to imagine, but the point of all of this food colouring malarky is that one by one, all of us got sick throughout the week. Mark: Aha! It must have been the food colouring! Confused face. Anyway, Ned turned one today, and we couldn’t have a party because Barnaby and Noah were too busy being pale-faced, sweaty and spewy in a delicate collapsed pile of little boy bones on the couch. I had my turn last night, and we suspect little baby Ned will have his turn tomorrow. Woo hoo! How marvellous it is to be part of a big family as we all succumb one by one to the filth and degradation of stomach buggery. As it were. Ahem. I shall post some photos of Ned’s fake birthday and his cake (which will be colourless, just in case Mark’s food colouring paranoia turns out to be true). And a photo of my blessed, naked eyelids. oh you poor things! Here’s hoping that you are all restored to full health by the time I’ve pressed the ‘send’ button. I don’t think it can be the food colouring that’s done for you all, there are some hideous sickness and the other thing that I never spell correctly on the go just now. 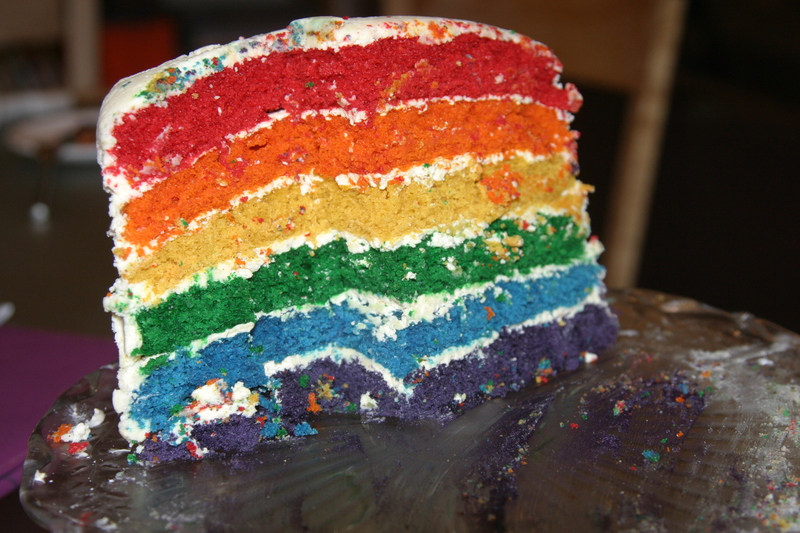 Perhaps it’s more likely to be one of them rather than your inspired rainbow cake? Happy birthday to Barnaby and Ned! 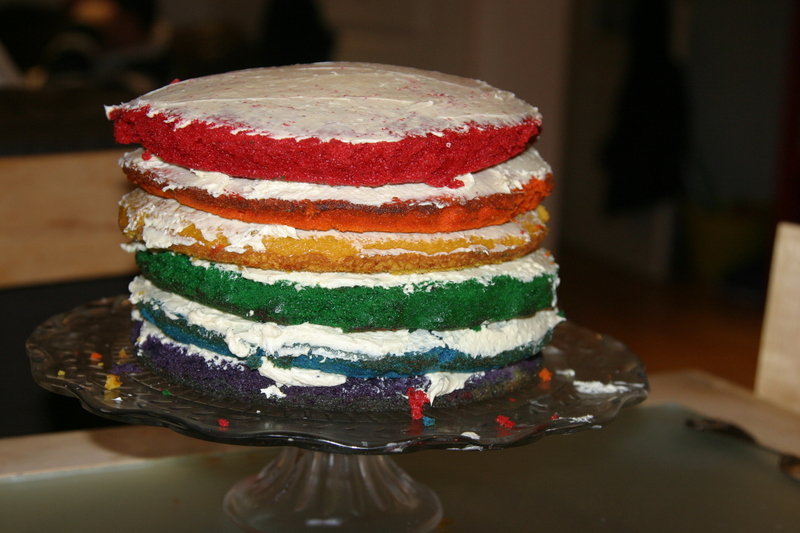 Yay – cake! Well done you. Have you had the lashes removed? You can sometimes use a bit of oil, and pull the clumps of fake lashes apart (pull hairs in opposite directions and they kind of fall apart). Also, they are quite good if you apply them yourself on top of a great crust of mascara. They stay on all night but will come off when you remove your makeup. There! That’s all I know about that. Hope everyone is recovering nicely from their stomach buggery. What a stunning cake, very impressed. Don’t think the colouring could possibly have led to stomach buggery, but hope you are all better now. Pingback: justb. brings the most interesting news to you | justb.